If you have a pup in the house, you know how easily they can sniff out the treats. My solution is to keep them in an airtight jar to keep them fresh and away from any sniffing noses. 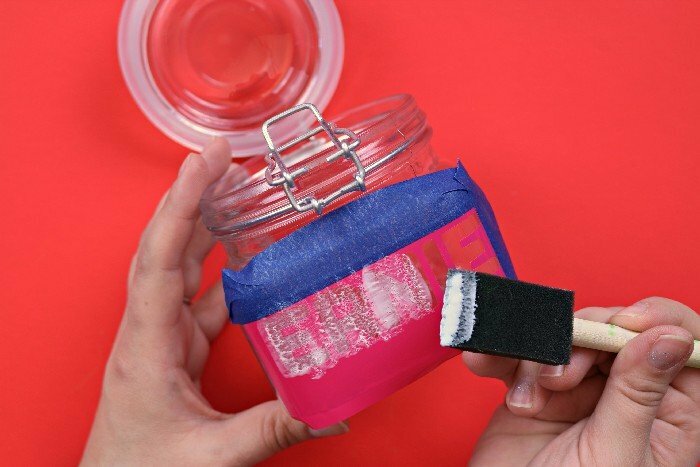 To make the jar extra cute, use a frost etching medium to add your pet’s name to the jar. 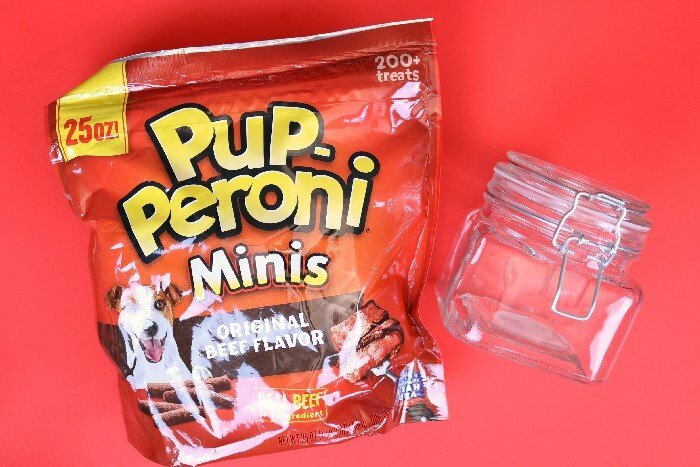 It takes less than half an hour to make your own personalized dog treat jar to fill with Pup-Peroni® treats from Meijer! It occurred to me that I have shared our new family member with you over on Instagram, but I haven’t introduced him on the blog yet! 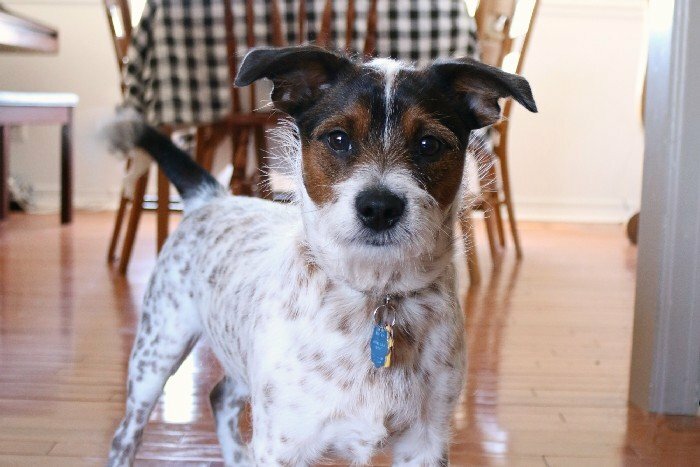 Last fall, we rescued Ernie Harwell, a Jack Russel/Blue Heeler mix. He’s about 9 months old now, and full of all kinds of puppy energy. 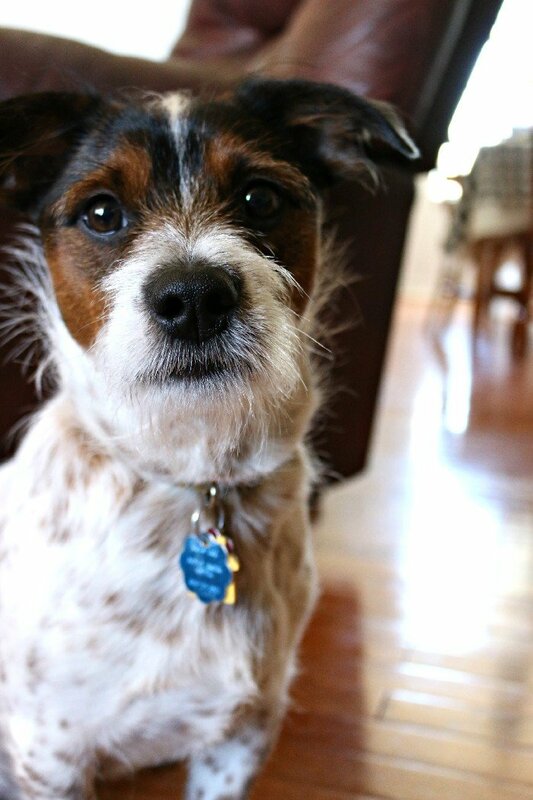 Jack Russel terriers and Blue Heelers are both very smart breeds, and Ernie is almost too clever for his own good. I have been working to potty train him, teach him a few tricks, and generally get him to be well-behaved. Some times I wonder if I am training him or if he is training me. I keep a good supply of soft dog treats in the house that I can use when I am working with him. He loves the new Pup-Peroni Original Beef Flavor Minis that I found at Meijer in the treat aisle of the pet department. 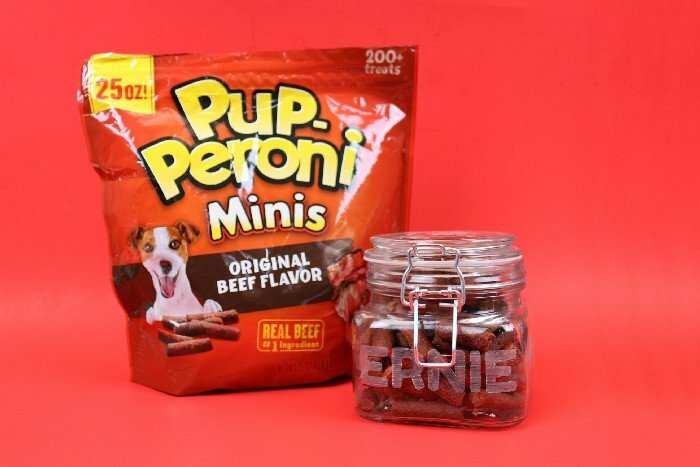 Honestly, these treats smell pretty awesome, so I can see why Ernie’s mouth starts to water when I offer him one. 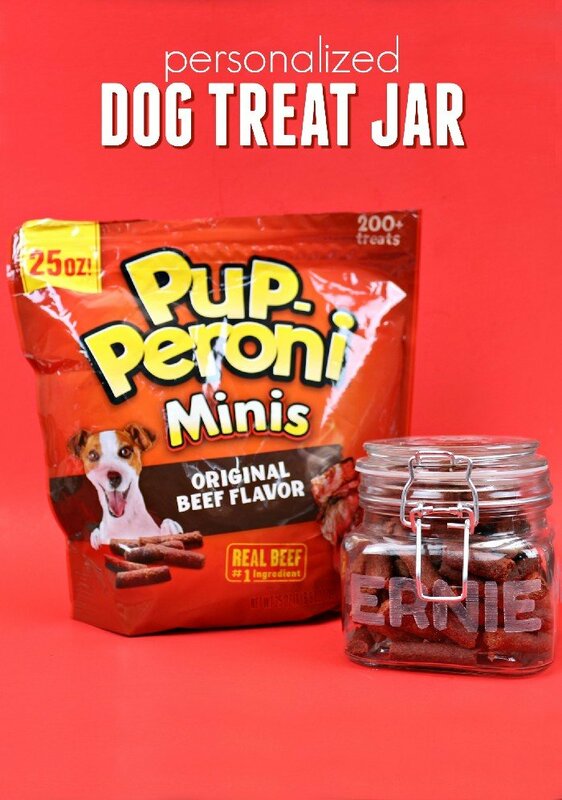 These treats have the same meaty deliciousness of Pup-Peroni Original Beef Flavor dog snacks, now the perfect size for smaller dogs. 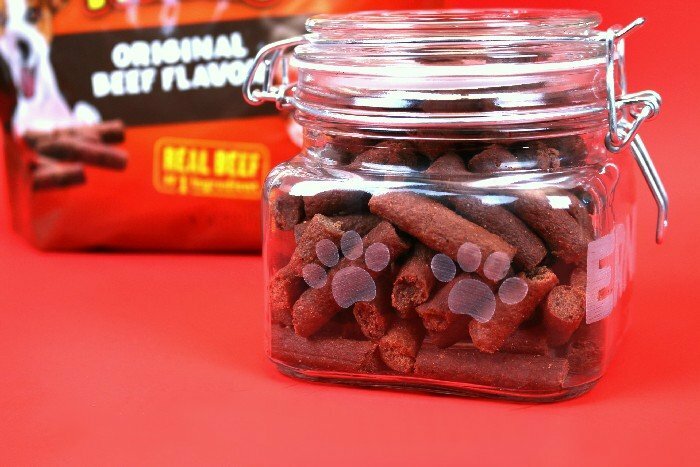 They’re made with real beef as the #1 ingredient and have a meaty flavor your dog will love! I found a glass jar with a metal clasp at the dollar store that I knew would be perfect to hold Ernie’s treats. 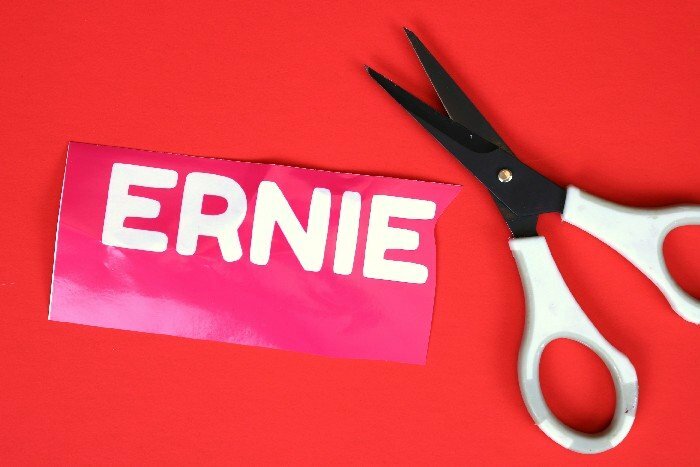 To personalize the jar, I used my Cricut to cut his name out of adhesive vinyl. I used outdoor vinyl, but stencil vinyl or any other strong grip vinyl will give you good results. You can use regular adhesive vinyl for this project, but the stencil may not give you the clean lines you are looking for. I used transfer tape to apply the vinyl stencil to the front of the jar. I also used some painter’s tape around the stencil to mask off the exposed glass. This prevents any “Oops” moments with the frost etching medium. I then applied a thin coat of Frost Etching medium to the stencil. I didn’t use real etching medium because I find this medium easier to use. If you have real etching medium on-hand, you can definitely use that. Just follow the package directions. 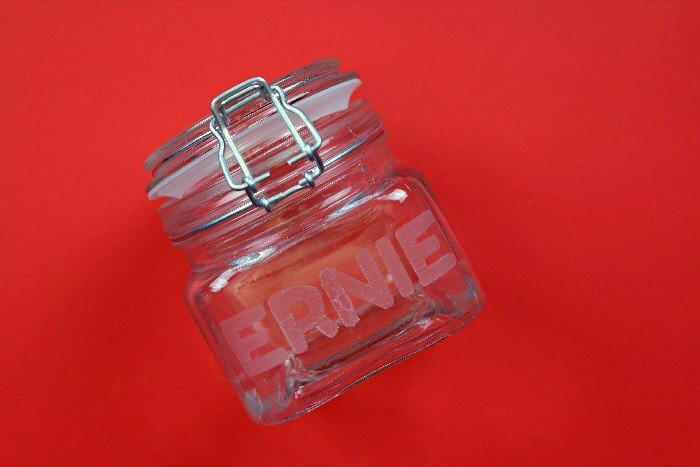 I removed the stencil to reveal the personalized jar. I also cut out a few paw print shapes to add to the top and sides of the jar. Ernie was more than a little intrigued by the new treat jar. So far I have taught him to sit, stay (kind of), and how to give high fives. The treats have been a crucial part of the training process, so I am glad he likes them so much! If you want to try out the Pup-Peroni Minis for your furry friend, you can save money at Meijer by using this coupon. I hope your pup likes them as much as ours does! Now, this is a dog treat jar I can get on board with! So many of them are just too cheesy! Thanks for the idea and coupon! Ernie is soooooooooooooooo adorable! 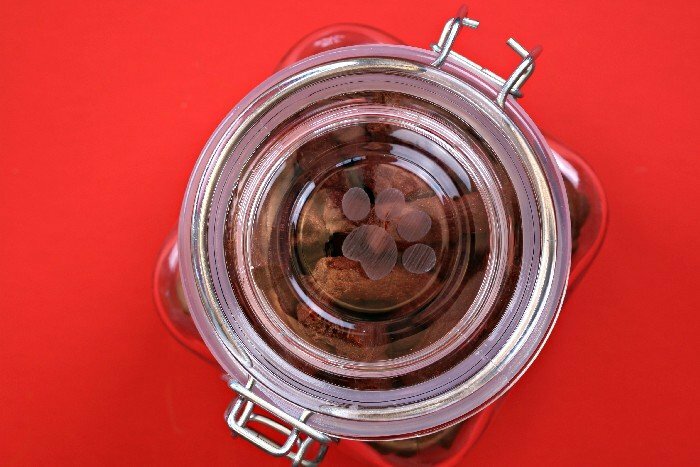 Love the treat jar DIY! I think Im in love with Ernie!! What a fun project.